unbaked... camera ran out of batteries! This is the last bread in the series, but I think it’s my favorite. It uses the same basic ingredients and procedure, but through different timing and shaping, it becomes a completely different end product. Ok, so there is some sage, but that doesn’t have any effect on the texture, so I figure it’s fair game. What’s focaccia without some herbs, anyway? You may be familiar with focaccia, as it’s become increasingly popular in the US in recent years, particularly as a sandwich bread. But focaccia can come in a wide range of shapes and textures: from a thicker, more typically-bread-like round; down to something like a thick pizza crust. In fact, there are sometimes so many toppings on focaccia that is might as well be a pizza. This loaf ends up being a little thicker, easily sliced in half to make sandwiches. I can see it now, spread thickly with grainy mustard or pesto, layered with prosciutto, turkey, and a spicy olive salad…. My mouth is watering! The beauty of a bread like this is the endless opportunity for variation. This recipe calls specifically for sage and garlic, but you can use anything. Rosemary, oregano, thyme, and basil would all be very delicious and authentically Italian choices; but why stop there? Mint would be wonderful, as would parsley (a highly underrated herb, in my opinion). Chives? Tarragon? Dill? Throw ’em in! And it doesn’t have to stop with herbs, either. Try any spice (cayenne, cumin, fennel, etc.) kneaded into the dough. Top it with sun-dried tomatoes! Dot it with ricotta! Let your imagination run wild! 2. Sprinkle the yeast over 1/4 cup of the water, stir to dissolve, and let stand 5-10 minutes, or until foamy. Stir in oil and remaining water. 3. Sift or whisk flour and salt together in a large bowl. Pour in yeast mixture, and mix to form a soft dough. 4. Turn out onto a floured surface and knead 8-10 minutes, or until smooth and elastic. 5. Place dough in a lightly oiled bowl, cover with plastic wrap, and let rise 1 to 1 1/2 hours, or until doubled in size. 6. Turn dough out onto a floured surface, gently press flat, and knead in chopped sage. (It may take a few minutes to evenly distribute the sage throughout the loaf, and some will certainly fall out. Just smush it back in.) Shape the dough into a ball and roll out to 10″ circle. Place in prepared cake pan. 7. Cover with plastic wrap and let rise 30 minutes in a warm place. Using clean fingers or the handle of a wooden spoon, poke dimples into the surface in a regular patter. Cover with plastic wrap again, and let rest until doubled in size. (Mine took 30-45 minutes.) Meanwhile, preheat oven to 400 degrees F.
9. 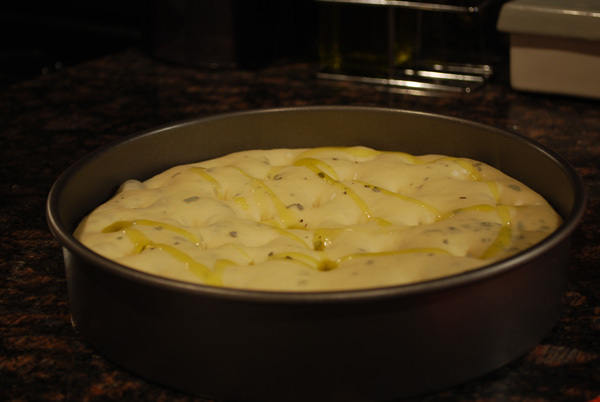 When fully proofed, drizzle with extra virgin olive oil, sprinkle evenly with garlic, and place sage leaves on top. 10. Bake for 25-30 minutes, until golden brown. 11. Remove from pan and let cool at least 15 minutes on a wire rack. Serve warm. 1. I decided not to use the garlic on top, solely because I didn’t feel like washing the cutting board. But it’s delicious! Try kneading the garlic into the bread for a more even distribution. 2. I dusted the top with some kosher salt when it came out of the oven, just because I felt like it. Oh, and please don’t omit the olive oil on top. It might seem like a lot, but spread out over a whole loaf, it isn’t much; and it serves to keep the bread moist, and help the toppings adhere. 3. If you like, sprinkle some bits of mozzarella or some freshly-grated Parmesan (not the awful stuff in the green can!) over the top, about 5 or 10 minutes before you pull it out of the oven. It’ll go all melty and delicious! 4. My cake pan was 9″, making my bread a little taller. But you don’t even need a cake pan, really; that just keeps it perfectly cylindrical. If you bake it on a sheet pan, the edges will be a little sloped, but it’ll still be round and lovely. 5. If you find it hard to roll out, cover it and give it a 5 minute nap, then have another go. No rolling pin? Use a clean wine bottle. No wine bottle? Press it out with your fingers. Easy! This bread is absolutely delicious! It tastes so authentic and wonderful I almost ate the entire loaf in one day.